Wales and Uruguay's players have disappeared from the pitch so it's time to direct you to our match report. And there's another match to focus on as favourites New Zealand take on Argentina at a jam-packed Wembley. Over 80,000 have turned out to watch the All Blacks and the Pumas in what is being billed as the biggest crowd in Rugby World Cup history. You can follow live coverage of that match by clicking here. Uruguay performed with guts and grit against the Welsh and Felipe Berchesi’s nine points was a joint record haul for any Uruguay player in a Rugby World Cup match. You'd expect them to tire as the tournament progresses, but they proved their worth during that 80 minutes. Rhys Priestland won't be expecting to start against England next weekend but he was, nevertheless, successful with seven of eight conversion attempts. "The game was won well, Hal Amos played well and is pushing for next weekend. The biggest concern is the injuries, but it is a case of job done and we move on. "Next week (against England) will have no resemblance to this afternoon." Click the Live Coverage tab at the top of this page for a choice of radio commentaries. Liam Williams, Corry Allen, Paul James, Dan Lydiate... all names onto the Wales injury list. There's chat in some quarters that a dead leg could keep Williams out for a few weeks, but we won't know for certain until Warren Gatland has his say. What have we learned from that match? Well, Wales' Hallam Amos becomes the fifth man in this tournament to have gained more than 100 metres. Rhys Priestland's conversion brings the match to an end. Eight tries for Wales but many people expected more. Had their handling been better the gap between the two sides might have been bigger. "Davies has grown in confidence as the game has gone on, you can see it in his body language. He's very sharp and strong on the fringes and he got a well-deserved second." One final chance for the Welsh? Uruguay flap in the scrum, presenting Rhys Priestland with another kick into touch. The catch and drive has been Wales' most effective weapon in this match and so it is again... the forwards do the work and Gareth Davies gets the glory, wriggling over as the forwards folds before the line. Rhys Priestland arrows the conversion between the posts. "Uruguay have worked their socks off, and there's a lot of tired men out there." "The New Zealand side would have put 70 to 80 points on Uruguay, no doubt about it. "It has been disjointed, just when you think Wales will put Uruguay to the sword they for some reason have had no continuity." We're into the final five minutes and Wales rooted in the Uruguay half without homing in on the tryline. Uruguay's defence fighting until the end. Wales will hope for a couple of more tries before the final whistle, but sloppy hands is stopping the men in red from completing those pre-planned backline moves. Dan Lydiate is another to leave the field. It's unclear whether he's injured or just has a gash. The back-rower would be a shoe-in to start against England next weekend but whether he will be available is another matter. "I was expecting 70-80 points from Wales, I thought playing at home the players would be bouncing. It has been a very professional performance from Wales, but not been awe inspiring." "Justin Tipuric is an exceptional footballer and athlete, he was in complete control and it was a case of hanging on until he went over the line. "The performance has not been as clinical as Wales would have liked, but 47 points is a good effort. It's been a familiar pattern: Uruguay not contesting the line-out, Wales' forward rumble on and collapse over the line in a heap. Justin Tipuric grounds the ball this time, though, and Rhys Priestland converts. "You'd like to see this Uruguay side get a score with the effort they have put in. They are amateur players but they are still working so hard. They have done exceptionally well, no matter what the final score is. I'm sure their coach will be proud of them." The crowd urging their men forward and they respond... Gareth Davies snapping at the base of the maul... but it's a scrappy period of the match as Uruguay steal possession, turning over ball with Alejo Corral enjoying a 10m dash. Messy. Cory Allen has had to go off injured but his hat-trick means he at least has the consolation of replacing England's Mike Brown as the tournament's leading try scorer. Allen is also third on the top points scorers list at this World Cup with 15. Japan's Ayumu Goromaru is top after he scored 24 points in his side's memorable 34-32 win over South Africa on Saturday, while Frederic Michalak collected 19 points as France gained a routine 32-10 win over Italy at Twickenham. The Cardiff crowd start a Mexican Wave as they wait for the red and blues to form a scrum. Uruguay struggling with that set-piece, penalised for folding and Wales gain acres of territory with a Rhys Priestland touch finder. Wales counter-attack with Gareth Davies displaying the speed of a sprinter down the left wing, getting a few fans off their seats no doubt. He hopefully passes over his shoulder... a man in red gathers... eventually Lloyd Williams dives over the line, but referee Romain Poite blows his whistle and calls the players back. They must return to the Welsh half because of a forward pass to Davies at the start of the move. No try for Williams. With just under 15 minutes left Wales are controlling possession and territory, with Uruguay rarely threatening the Wales 22. Scott Williams the latest Welsh player to break the gainline, side-stepping one defender before sprinting like a greyhound through the middle. The Scarlet finds Alex Cuthbert superbly but the winger's handling isn't his forte and he fails to gather when the tryline beckons. "All about the power play up front, Davies had a very simple decision to go right and the winger was in two minds. It was very well organised and executed by Wales. The contrast with these two sides has been the set-piece play, and the power and organisation of the Welsh pack." That's try number six for Wales. Again, it's a bulldozing surge from the line-out which does the damage and Gareth Davies collects from 3m out and touches down unopposed. Rhys Priestland blooters the conversion, however, dragging his effort wide. Great Britain Paralympic shot-putter and discus thrower Aled Davies is among those Wales supporters showing concern at the mounting injury list. "Wales! Wales!" cry the Wales faithful as the forwards gain acres, barging through blue-shirted men in their side. Uruguay frequently being punished now such is the pressure they're under. Rhys Priestland with another kick to touch... Dan Lydiate replaces Sam Warburton before the line-out forms. Poor Gaston Mieres. He's the last line of defence and is gang tackled by men in red, but the Uruguayan does well, sweeping up at the back and holding firm until support arrives. Bath-bound outside-half Rhys Priestland has made a few mistakes in this match, but five times he has attempted a conversion, five times he has been successful. "Cory Allen's played reasonably well, but it's another blow for Wales in terms of depth going in to the England game." Cory Allen is the latest Welsh injury concern. The centre's legs tackled in the tackle and the Cardiff Blues man, the hat-trick man, is gingerly making his way from the field. That doesn't look too good, either. Lloyd Williams takes his place. If you're Welsh fit and healthy and available for the next five weeks it's probably best you give Warren Gatland a call. Uruguay make a rare trip into the Welsh half and for a short period they threaten... Joaquin Prada making a barnstorming run... Wales being made to work harder than they thought they'd have to. "Sloppy defence, but Gareth Davies is renowned for this kind of work, he's exceptionally quick. Amos is very sharp, but great to see Davies back to his attacking best from the lineout." "That is what Gareth Davies can do for you, he is so explosive and times the pass well, Hallam Amos has good speed and that was a great support line from the winger." There's no doubting it - that is a try. Gareth Davies, snipping and snapping, cutting loose and sets Hallam Amos free for his first try of the match. Under the posts the winger strolls and Rhys Priestland doesn't miss conversions from in front of the uprights. Simple but effective. Wales's forwards surge forward from the line-out and from the side Justin Tipuric emerges with the ball but he looses possession as he grounds the ball, a uruguay defender just getting a hand to it, and that's another error from the men in red. "You have to be clinical, but Rhys Priestland has made two basic mistakes since half-time. He'll be disappointed - and so will Warren Gatland." A double substitution for the men in red, with Ross Morriaty and Dominic Day replacing James King and Luke Charteris. The new forwards straight into action, helping form a driving maul from a line-out a smidgen outside Uruguay's 22. Four tries from Wales in the first half, but how many will they go on to get? Ireland have scored the most in the tournament so far, crossing the line seven times in their 50-7 win over Canada, with England scoring five tries in the opening day 35-11 win against Fiji. Wales will score more, but things aren't quite going to plan at the moment - Rhys Priestland missing a touch-finder, a common error from teh outside-half, and then proceeding to lose the ball in the tackle. Hallam Amos breaks through from midfield, but he is tackled and caught isolated and those pre-planned moves not quite coming off for the Welsh. Rhys Priestland attempts the chip over the Uruguay defence, but the men in blue are alert to the tactic. The players are back on the pitch and it's Rhys Priestland who gets the game started again. There's been a change in the Welsh pack, too, with Samson Lee being replaced by Tomas Francis. Uruguay flanker Matias Beer has made the most tackles (7) in the opening 40 minutes, but illustrates that Uruguay have spent the majority of the half under the cosh. Wales were 6-0 behind inside the opening 10 minutes but dominated from then on, as these statistics show. It's not always been pretty but so far, so effective from the Welshmen. That injury to Liam Williams could be a big worry, however. "Brilliant play from Justin Tipuric. It was his composure, taking the ball in one hand and passing it to Hallam Amos, who set up Cory Allen." And with that conversion the first half ends. Off the players go. "Uruguay needed to regather themselves at half-time but once Wales got the ball in their hands, it was all about a try. Great work from Tipuric, and although we've not seen a huge amount from Allen he's got a hat-trick. "It's been a good, professional and disciplined performance from Wales. Uruguay have competed well, but Wales are starting to find thee spaces out wide. It could be a long second 40 minutes for Uruguay." Uruguay's scrum retreats and James King makes amends by winning the ball... Alex Cuthbert's given a sniff down the right... before Wales switch left... Hallam Amos gains a few meters down the touchline before presenting Cory Allen with another straightforward run to the line. Rhys Priestland cotninues his 100% record with the boot. James King punished for not binding at the scrum and this is scrappy from the Welshman, gifting Uruguay the ball. There'll be plenty for Warren Gatland to talk about at half-time. The crowd groan in unison as they watch another promising Wales move ruined. Cory Allen passing into touch instead of to Alex Cuthbert as the backline attempt to spin it wide. Cuthbert looks skywards, as frustrated as the Millennium Stadium crowd. Silly errors stopping Wales' attack from flowing freely. Just when Jake Ball looks to have punctured the Uruguay defensive line, referee Romain Poite blows his whistle for accidental blocking. "Liam Williams got walloped again in the leg, he doesn't want to come off but he has had the nod. I agree with that, get him off the field and right for Friday. "I totally agree. We saw what happened to Wales' first-choice full-back Leigh Halfpenny, who was ruled out before the tournament by injury. "A game like this is tailor-made for Matthew Morgan." Liam Williams shakes his head as he leaves the field. The full-back seems to be suffering with a dead leg which hopefully won't ruin his chances of playing against England, but he does need game time after his recent injury absence. Matthew Morgan is is replacement. Such is the pressure of having to defend against Wales' giants, Uruguay are frequently straying offside and that gives the Welsh the chance to go for another line-out. The men in blue holding firm, though, and it's another botched attack from the Welsh. BBC Sport Wales' Richard Williams at the Millennium Stadium: "Every time the ball goes dead or there's a break in play Liam Williams is receiving treatment on his leg after that heavy tackle. "This is a major concern for Wales, and the crowd sound anxious." But Luke Charteris loses the ball in contact and a promising move is ruined. Paul James has left the field by the way and is replaced by Aaron Jarvis. It looks like the prop needs some ice on an ankle. Oh boy. "Simple, just one thing Uruguay hadn't done is miss one on one tackles, but they do there and it leads to a simple two on one for Wales." "That's the first time Scott Williams has managed to break through a solid Uruguayan defence, then he puts through a neat short pass for Cory Allen. Scott Williams is certainly finding his feet now." It's quick line-out ball and brilliance from Scott Williams. Regal handling from the centre and a salsa dancer's footwork putting Cory Allen into space and the Cardiff Blue has an easy stroll under the post. Rhys Priestland with an easy-peasy conversion. Uruguay flanker Juan Manuel Gaminara is punished for a dangerous tackle and Wales are continuing to aim for touch instead of the posts. Rhys Priestland takes his men into the opposition 22, but Wales are making a number of needless errors. Accidental obstruction this time in a would-be maul and Uruguay frustrating Sam Warburton and co.
Wales have enjoyed slightly more of the possession, but it's closer than many would have predicted. Uruguay's scrum solid in their own half and that sets the men in blue on their way once more. They've yet to truly threaten the Welsh tryline, however. "Berchesi has been very solid, his kicking is good, so is his distribution but his defence has been top-drawer." Four penalties already conceded by Wales, and it has cost them nine points with Felipe Berchesi successful with three out of four attempts. Liam Williams hobbling and he waves to the bench. The Scarlet's match could be over and that could potentially be very, very bad news for Wales - they lost first-choice full-back Leigh Halfpenny to injury before the tournament even started. Williams remains on the field for now, however. Perhaps it's just a dead leg for the full-back. Meanwhile. Felipe Berchesi has added three more points to Uruguay's score. The Welsh forward dominating and the backline licking their lips and perhaps a tad too eager to get ball in hand. Cory Allen spills the ball which sparks a chase back into the Wales 22. Rhys Priestland covers brilliantly, but Uruguay retain possession and come forward again. "There is no sweeper in Uruguayan defence, looks like it was something that Wales have worked on that chip before the game. "Great skills from Rhys Priestland and well taken by Cory Allen. "You saw 7-6 and thought it could be another Japan, but normal service has resumed." Wales confident and it's Cory Allen who picks up a canny Rhys Priestland kick and bursts through the midfield. He's got Rodrigo Silva dragging him down, but the Cardiff Blues man wriggles over the line and the TMO deems that a try. Another conversion from the outside-half and Wales are finally rolling. "Great patience from Wales. The forwards all did their job and eventually they were too powerful. "That's great for Samson Lee, after all that time with the physios, to start the World Cup with a try." "He's delighted, his first game back for a long time - Wales have a lot of hopes pinned on him. That was well-worked by Wales, once the ball got to the back it was all about power. Lee has the perfect stature for a tight-head prop. "Wales have so much more power, experience and stability up front once they take control we'll see players like Liam Williams come into their own." Luke Charteris was the go-to man in the line-out and from the resultant maul, which involved backs Scott Williams and Alex Cuthbert, Warren Gatland's men surge forward and it's Samson Lee who is last up from the floor. Rhys Priestland converts. "Better from Wales with some strong carries, but in fairness to Uruguay they look organised in defence, making their one on one tackles." Wales have conceded four penalties in the first 10 minutes. Undoubtedly, they need to improve their discipline, among other things. Rhys Priestland puts Scott Williams into space, but the Scarlets captain is brought to a standstill by a firm tackle. Wales recycle possession, though... the backline keeping ball in hand and advancing forward. After those two early penalties, some words of advice to Wales from former England centre Jamie Noon... he means tendency by the way. "It's a brilliant start from Uruguay. I'm shocked how organised they are, and they're not afraid to play either. "It's not panic stations for Wales yet, though." "A very impressive start from Uruguay, they are looking to move quick ball from the breakdown and they are starting to find the gaps. "The opening 15-20 minutes, you just have to absorb what Uruguay will throw at you and slowly take control of the game." Luke Charteris the offender as he fails to roll away from the tackle and that gives Felipe Berchesi another chance to test his radar from 20m out and it's another three points for the South Americans. The Millennium Stadium library quiet. The men in red giving their fans little to cheer. Brilliant stuff from Uruguay, a chip through by centre Joaquin Prada has Wales backpedaling... the visitors into the opposition 22! "A great start, just what they wanted. Disappointing from Wales, you can't give away silly penalties like that in your own half. "Uruguay are not the biggest side, and I can only see Wales getting stronger as the game goes on." Felipe Berchesi aims at the posts just inside his own half but he undercooks it. Worth a try, I guess. The underdogs have started well. Wales have had little of the ball so far. Jake Ball with a fine take at the line-out which gives Wales their first opportunity to attack the men in blue. The forwards rumble forward before Gareth Davies spins it wide... Cory Allen attempts to weave through two defenders but he's isolated and holds on for a tad too long. Felipe Berchesi. Uruguay's outside-half, is a reliable goal kicker and proves so with a straightforward penalty from about 30m out. For what it's worth, it's all Uruguay in the opening two minutes. Low key entry of the teams compared to the normal flames and fireworks. But at least we'll be able to see the early action without the fog of smoke. The crowd help with the countdown. A fine chase from Uruguay on the kick and the underdogs earn a penalty as Justin Tipuric fails to stay on his feet at the ruck. Use the 'Live Coverage' tab at the top of the page to listen to live radio commentary. There's also coverage in Welsh if that tickles your fancy. Wales were dealt two huge blows when full-back Leigh Halfpenny and Rhys Webb were ruled out of the World Cup with injury earlier this month, but their absence presents others with opportunities. Scrum-half Gareth Davies makes his first Test start today, and former Wales captain Martyn Williams thinks he will make an impression. "Gareth has the attributes of a world-class scrum-half. Hopefully he'll have a big game today." It's a mixed choir on the turf for the national anthem instead of the usual brass band and male voice chorus that we've become accustomed to during the Six Nations. It different, but a sound which will still induce goosebumps. Uruguay's anthem is a jaunty number and has caused some of the team to fill up with tears. There are advantages to playing at home, and there are certain pressures too. Wales have beaten Argentina twice and Japan twice on home soil at a Rugby World Cup, but they have also suffered defeats - three times to Australia and twice to Samoa. No-one is expecting anything other than a Wales victory at the Millennium Stadium today however. Under five minutes until the Millennium Stadium erupts. Wales captain wipes his brow as he prepares to lead his team into battle. Scott Williams standing behind him, a big gulp from the centre as they await the call. Will Wales slay Uruguay just as they did Namibia four years ago? That match, by the way, marked the most points and tries Wales had scored in a Rugby World Cup match. They will certainly need a bonus point ahead of the tougher ties which are to come. Uruguay have won just two matches at a Rugby World Cup and have been absent from the tournament for 12 years so what does coach Pablo Lemoine make of his team's chances today? "It's a very difficult challenge, we never play against these types of teams", he says. "We are looking forward because we know what they are capable of and, if we don't do our things correctly, our defence and our offence, we are going to suffer." "After concerns about ticket sales ahead of this match, the ground is filling up nicely and there are no tell-tale flags over the seats at one end of the ground, which normally signifies a smaller than usual crowd. "The mix of fans is extraordinary. Japanese, Australian, Irish and Fiji shirts are dotted among the the daffodils and sparkly cowboy hats we have come to expect in Cardiff. "The World in Union - it must be, there are even some England shirts on display." Fifteen minutes until kick-off and the teams are warming up on the Millennium Stadium turf and Wales prop Samson Lee is among them. He's the sort of man who goes ferreting instead of celebrating victory over South Africa with his team-mates. But the Scarlet, described as a once-in-a-generation tight-head by Lion Adam Jones, has quite ferreting for rabbits to ensure he's 100% for the World Cup. That's dedication. "The last thing I want is to slip and rupture my Achilles again. I'm trying to keep off it," said 22-year-old, who ruptured his Achilles against Ireland during the Six Nations. BBC Sport Wales' Richard Williams: "Cardiff has the feel of a city where something special is happening - like a Six Nations match day, but different. "Outside the ground the Fanzone is milling with fans of all ages wearing a wide variety of team colours. As well as the red of Wales and the blue of Los Teros, there are Irish, Tongan, Fijian and at least one Cook Island shirt on display. "The neutrals - and there are a lot - will want to see a repeat of Japan's defeat of the Springboks. Welsh fans, on the other hand, will feel they have been on the wrong side of enough World Cup shocks already, thank you very much!" Every cloud has a silver lining, so they say, because Leigh Halfpenny's injury has inspired Welsh entertainer Max Boyce to write a new song, called The Halfpenny piece. There's no denying Leigh Halfpenny's absence from this World Cup is a loss for Wales and the tournament. For those of you who don't know, you can get updates on team news, scores and results on your phone thanks to the BBC Sport app. If you like the sound of that - click here to find out more. There's live coverage of this afternoon's match on BBC Radio 5 live sports extra - which you can listen to on this page - and there's also live coverage on BBC Radio Wales. Take your pick. Uruguay's squad is full of amateurs and no-one in coach Pablo Lemoine's line-up has played at a Rugby World Cup before. On the back of Japan's victory over South Africa, if Uruguay beat Wales fish will start climbing trees and the sky will turn fuchsia pink. 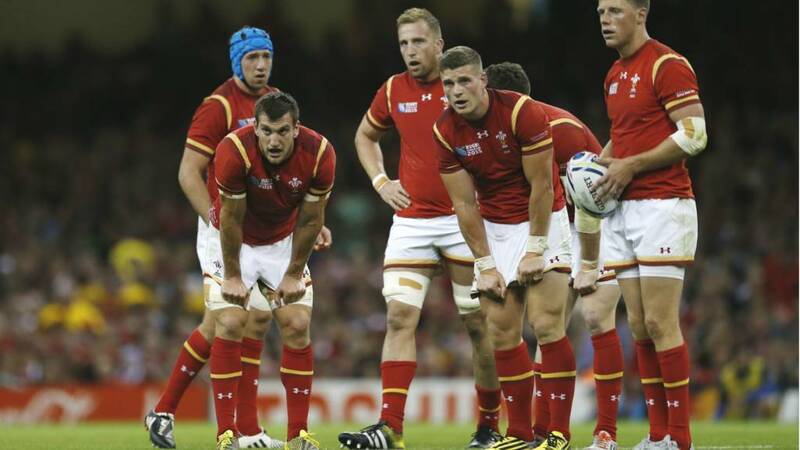 "We will go with our foot down for the full 80 minutes," says Wales captain Sam Warburton. The men charged with just doing that this afternoon are not Wales' big-hitters, but Liam Williams and Samson Lee, key players in this tournament, start after recently coming back from injury. Warren Gatland, perhaps rugby's equivalent of former Manchester United boss Sir Alex Ferguson for his enjoyment for manipulating the mind, has been bullish on the back of the disappointment of losing three key players to injuries. If you [reporters] write us off as much as possible, which seems to be happening at the moment, that’s the best situation for a Wales team to be in. Those things galvanise us and make us stronger, so continue to do it. There's no Leigh Halfpenny, no Jonathan Davies, no Rhys Webb. Three of their best players are out, out, out. They're in the Group of Death and underdogs to progress to the quarter-finals. Australia are still to come. England are still to come. But Wales fans are an optimistic lot when it comes to rugby, sort of, and there's no better way to start the most closely contested Rugby World Cup in recent memory than an opener against a group of part-timers.